Eco-friendly Household Items: Jane or Johnny freshman is going to need to do her or his own laundry from now on. Include fragrance-free laundry detergent. The most eco-friendly laundry detergent options will also be formaldehyde-free and free of petrochemicals. Look for one with a coconut oil base. Throw in a roll of quarters for good measure. Reusable Coffee Mug: Caffeine is about to be Jane or Johnny’s very best friend. Include a reusable travel coffee mug in their care kit and explain that using one of these is better for the earth than using and discarding a paper cup from the university coffee shop every day. If they have a coffee maker in their dorm, include a package of fair-trade coffee. Used Books: Explain to your protege what a rip-off it is to purchase textbooks at the university bookstore. Provide them with a list of resources that they can use to buy used books or rent textbooks. Betterworldbooks.com is one great organization that donates a book to a needy part of the world every time you buy from them. They also offer free shipping! For all the good they do, it is important to note that it takes quite a while to receive books ordered from them, so advise Jane or Johnny to order their books from BWB a few weeks before they’ll need them. Personal Care Products: If Jane or Johnny is like many young people, it’s likely that she or he has been mooching off of the communal, economy-size family tube of toothpaste and bottle of shampoo for all of her or his young life. By gifting toiletries, you can help give them examples of personal care products that are healthy for their bodies and for the earth. Include items like aluminum-free deodorant, natural toothpaste and organic shampoo. Items like this can be found at places like Natural Grocer. You may also want to research natural food stores near their campus and let them know where they can find replacement items when they run out. Dorm Furnishings: Many little ducklings will be enticed by the colorful dorm furnishings offered by department stores. However, it can be easier on the wallet, greener, and more fun to take your recent high school grad out garage sale-ing and thrift-storing to find certain items. Decorative items like photo frames, utility items like lamps, and furniture like desks and bedside tables should be pretty easy to find. Help direct the youngster away from the back-to-school variety of crass consumerism by spending an afternoon thrift-storing together. In the care package that I made for my younger sister I also included a “stabby kitty” – a personal protection device that attaches to a key-chain and can be worn on the hand and used to add some oomph to a punch if said punch is warranted by an attacker. I recommend equipping a female student with some kind of personal safety device if she is going to live on campus. This was one of my sister’s favorite items in the basket. She also thought it was pretty cool and grown-up that she had her very own laundry detergent. This was a little bit more fun to put together than the standard card-and-cash (although I did put some cash in the card too, for good measure). Tailor your package to your grad’s interests and needs! 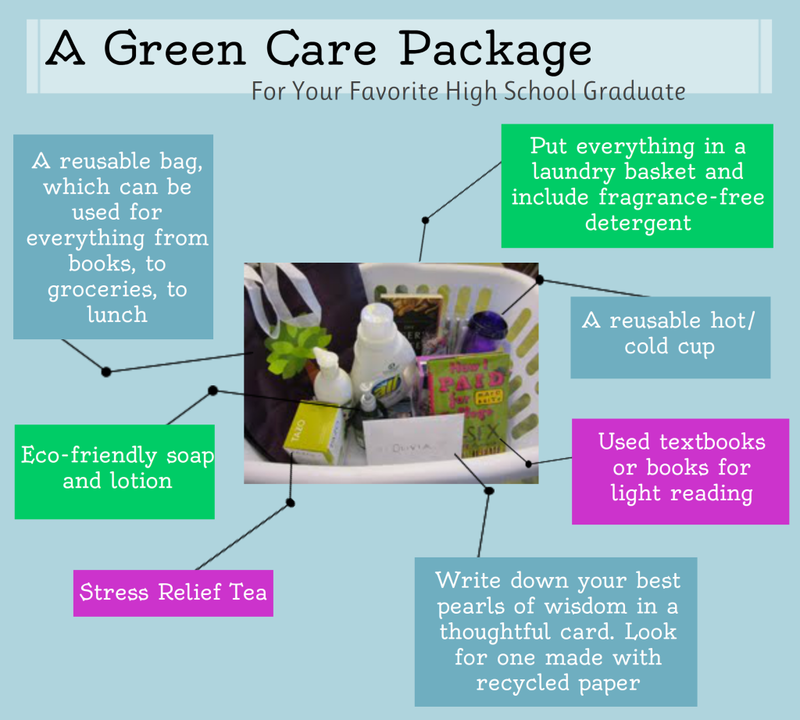 If you have any other good ideas for green gift basket items, please post them in the comments below!